It is noteworthy that the first syllable in the word Mir-a-cles is mir. 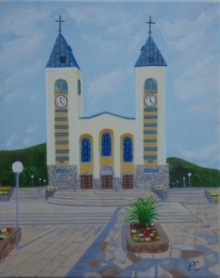 In the village of Medjugorje the word mir means peace. If this world could obtain peace it would certainly be a miracle. Imagine the word Mir written across the sky above one of the known apparition sites in Medjugorje. It was witnessed by thousands of people at the same time. Often, during the nightly apparitions, there would be gatherings of people outside and around the church of Medjugorje. One evening, during such a gathering, a man looked at the cross that is on the mountain top (Mt. Kreizevac) in Medjugorje. He noticed that the cross was gone and in its place was the apparition of the Queen of Peace. He told the gathering to look at the mountain top and thousands witnessed the vision with their own eyes.